With our Zapier integration, you can integrate with more than 900 other web services like Gmail, Evernote, Facebook and Google Docs. Now your Benchmark account is more powerful than ever. Add emails from your Gmail account to a Benchmark Email list. Connect GoToWebinar attendees and registrants to your Benchmark Email account with ease. Add Eventbrite attendees to a Benchmark Email list automatically. Add Benchmark Email subscribers from Google Docs spreadsheet rows or send Benchmark Email subscribers to a spreadsheet. Add subscribers to your Benchmark Email account with Wufoo. Add Desk.com customers to a Benchmark Email list or vice-versa automatically. Pass contacts back and forth between Benchmark Email and Capsule CRM. Pulls your customer’s information from LiveChat and adds it to a list in your Benchmark Email account. The Zapier integrations allows for two functions. A push and a pull. If an individual signs up on one of your Benchmark Email signup forms, it will trigger a 3rd party app also integrated with Zapier into action. This could mean a Benchmark Email user is alerted to schedule a call or an appointment. 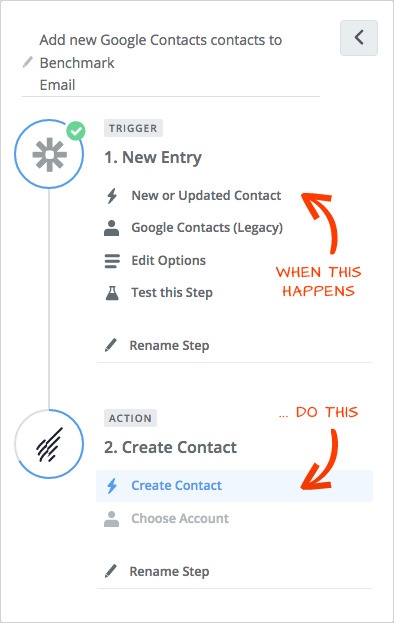 Inversely, when someone interacts with one of the 3rd party services also integrated with Zapier, their email address can be pulled into your contact list. For example, if someone emails you in Gmail, their email address will be added to your Benchmark Email account automatically. - Sign up for a free 14 day trial on Zapier to try it out, and if you like it you can sign up for a paid account. - Create a Zap, which is a task made up of two things: a trigger and an action. Each zap involves two web services, one serving as the trigger and the other as the action.